This is a bluetooth Hifi stereo mini Amplifier. bluetooth Hifi stereo mini Amplifier，high-quality sound. 1x Stereo Amplifier. 1x English user manual. Signal Input Type: RCA, 3.5mm interface. Apply to car motobike(12V). • Max capacity： 200W. 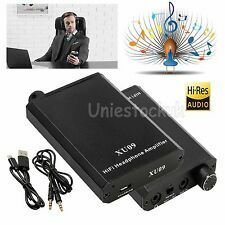 1 x Mini Hi-Fi 2.1 Amplifier. · Jack input: 1/8" (standard stereo jack). • MP3, mp4, iPod, CD player input jack. • Standard stereo jack. · Frequency response: 20Hz-20KHz. · Speaker Impedance: 4-8Ω. For years the LP-2020A dominated the mini amp arena, but due to the scarcity of the Tripath TA2020 amp chip, Lepai is phasing out this very popular amp. Simple and straightforward, this amp is easy to use. Nobsound®——Dou​k Audio. Nobsound®——Douk Audio. Nobsound Mini Bluetooth Digital Power Amplifier Hi-Fi Amp Stereo 50W 50W_Black. Nobsound NS-01G Pro Mini Hi-Fi Bluetooth Power Amplifier. This is Nobsound's new power amplifier in 2017. This is a bluetooth Hifi stereo mini Amplifier. 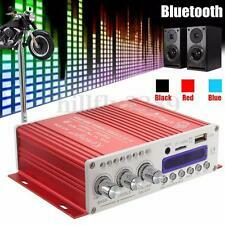 bluetooth Hifi stereo mini Amplifier，high-quality sound. 1x Stereo Amplifier. Apply to car motobike(12V). Signal Input Type: RCA, 3.5mm interface. Color:Blue,Red,Black. 200W max power output. It also has a jack for plugging your MP3, MP4, iPod or CD player. Smart, lightweight aluminium casing. 1 x Hi-Fi Stereo Amplifier. MP3, iPod, CD player input jack. Speaker Impedance: 2-8Ω. 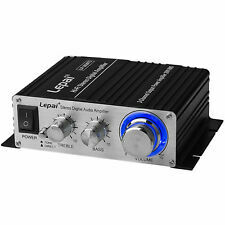 1Pcs Lepy HIFI LP-168USB Bluetooth 4.0 Audio Amplifier. Bluetooth Version 4. Back Panel 2 audio inputs, 8 clamp, USB plug, Power input. MP3, iPod, CD player input jack. Input impendence 47K. 1Pcs 12V/5A US Power Adapter. HiFi Art-Elfidelity. Hi-Fi Tube Amplifier. Digital Amplifier. Integrated Amplifier. Headphone Amplifier. Audio HiFi & DIY. AV Tube Integrated Amplifier. This isthe latest version, perfect circuit layout and components. 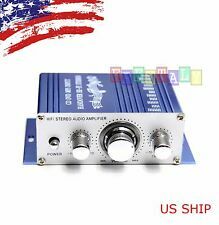 HiFi 6J9 Tube Audio Stereo Vacuum Amplifier Mini High-current Headphone Amp US. 2 X 6J9 tube. Can easy push HD650 / HD580 / HD600 / K701 / K702 / Q701 etc. headphone. Adapter Headphone Impedance: 18-600 ohm. Max Capacity： 200W. 200W max power output. 1 x Mini Hi-Fi 2.1 Amplifier. Jack input: 1/8" (standard stereo jack). MP3, iPod, CD player input jack. 1 x AC adapter. Frequency response: 20Hz-20KHz. We will work on resolving your particular case ASAP. Little Bear P5 6J1 HiFi tube Pre-Amplifier. 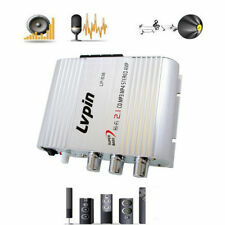 CD/MP3 player--->6J1 preamp--->Power amplifier--->speaker. HiFi Art-Elfidelity. Hi-Fi Tube Amplifier. Integrated Amplifier. Digital Amplifier. Headphone Amplifier. 1. MP3, iPod, CD player input jack2. 200W max power output3. 2.1CH, Low distortion4. Great for use on your vehicle or your home5. Smart, lightweight aluminium casing1. DC Input: 12V 2A2. Jack input: 1/8" (standard stereo jack)3. Voltage: 12V4. Material: lightweight aluminum5. Dimensions: 14 x 10.5 x 4cm (5.5 x 4 x 1.5")6. Input impedance: 47K7. Speaker Impedance: 2-8Ω8. Total harmonic distortion: 80dB10. Frequency response: 20Hz-20KHz11. Color：BlackNote: Power adapter is not included!Package included：1 x Hi-Fi Stereo Amplifier(Power adapter is not included)Note:Light shooting and different displays may cause the color of the item in the picture a little different from the real thing. The measurement allowed error is /- 1-3 cm. . It also has a jack for plugging your MP3, MP4, i Pod or CD player. 1 x Hi-Fi Stereo Amplifier. Jack input: 1/8" (standard stereo jack). Frequency response: 20Hz-20KHz. Low distortion. DC Input: 12V-18V 2A. 2 microphone jacks and Echo effect. 1x Amplifier. - FM radio. Channel: 2.0 channel. Detail Image. Model: 33BT. Impedance: 4-16 ohms. SNR: ≥70db. Nobsound®——Dou​k Audio. Nobsound®——Douk Audio. HiFi Art-Elfidelity. Hi-Fi Tube Amplifier. Digital Amplifier. Integrated Amplifier. Headphone Amplifier. Audio HiFi & DIY. 1 x Hi-Fi Stereo Amplifier(not include power adapter). - MP3, iPod, CD player input jack. - Stereo sound and heavy bass output. It also has a jack for plugging your MP3, MP4, iPod or CD player. DC Input: 12V-18V 3A. Nobsound®——Dou​k Audio. Nobsound®——Douk Audio. The newest tube preamp of Nobsound with upgraded function and design. This new product will satisfy you again. 2 6J1 tubes. HiFi Art-Elfidelity. Hi-Fi Tube Amplifier. ● 4 ways input: 3.5mm AUX, USB, coaxial, optical. GeneralModel: Q5. ● Power adapter: US input: 100-240V 1.5A 50 / 60Hz, output: 19V 5.3A. ● High-quality aluminum alloy case, exquisite and durable. ● Output: 2 channels ( stereo ), subwoofer. Nobsound®——Dou​k Audio. Nobsound®——Douk Audio. This is the latest version, perfect circuit layout and components. Mini size, Simple compact design but practical and powerful, the best HiFi and Cost-effective power amplifier. Description: This HiFi headphone amplifier, delicate, compact, lightweight, and portable, can improve your smartphone sound quality, making it possible for you to enjoy HD clear pure stereo sound without distortion. You're worth it! . HiFi Art-Elfidelity. Phono Pre-Amplifier. AUX function is tube buffer function to get thebetter warm sound, so you can setup T7 work for AUX or phono by input selector. Reason B: T7’s RIAA function part broken. It also has a jack for plugging your MP3, MP4, iPod or CD player. Smart, lightweight aluminium casing. 1 x Hi-Fi Stereo Amplifier. MP3, iPod, CD player input jack. Speaker Impedance: 2-8Ω. Jack input: 1/8"" (standard stereo jack). Mini HiFi power amplifier, delicate, small, portable and portable. Enhanced output, enjoy high definition. HIFI sound, noise reduction and dynamic enhanced distortion, perfect pure stereo effect, high definition music sound quality optimization. Nobsound®——Dou​k Audio. Nobsound®——Douk Audio. This isthe latest version, perfect circuit layout and components. Mini size, Simple compact design but practical and powerful, the best HiFi and Cost-effective power amplifier.